We’ve been traveling quite a bit recently, and along the way it was a bare necessity that we stay connected to work and email, and let the kids stream content like movies and TV shows – preferably with the fastest connection we could find. We took the Sprint 4G LTE Tri-Fi Hotspot with us to test the wireless device at airports, on trains, buses, and even on a 12-hour family road trip from NYC to Chicago. 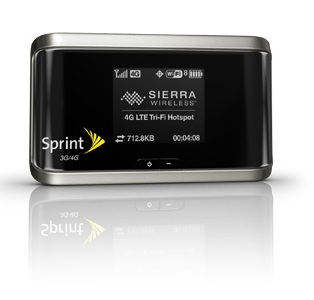 Manufactured by Sierra Wireless, Sprint’s 4G LTE Tri-Fi Hotspot is a “first-ever device” that gives you access to Sprint’s 3G, 4G WiMAX and 4G LTE network for internet connectivity. Depending on the fastest network available at your current location, the Tri-Fi Hotspot will kick in to either 3G or 4G mode automatically. While the Tri-Fi hotspot was indispensable for me to put together last week’s newsletter literally while driving through the Pennsylvania Wilds, there are a few things I wish it did better. In major metro areas like New York City and Detroit, the service was blazingly fast and worked perfectly as promised. However, while commuting into New York on the train, at major airports (JFK and Orlando Int’l), and driving the more rural areas between New York and Chicago, the fastest we were able to muster was 3G service. The Tri-Fi had solid coverage everywhere we went, in most cases when the device had spotty reception, the same was true with two of our cell phones - even on a competing network. While the 3G service delivered good performance, the 4G service coverage wasn’t nearly as frequent as we were hoping. To give you an idea, we consumed about 3x the bandwidth on the 3G network as we did on the 4G network (170MB on 3G vs 56MB on 4G). I attribute this to the fact that we were traveling beyond the bounds of major cities – at Walt Disney World and along I-80 through New Jersey, Pennsylvania, Ohio, and Indiana. The device was more bulky than I was expecting at about twice the thickness of a current mobile phone– this isn’t something to slip into your jeans pocket. But what it gives up in design it more than makes up in length of use between charging thanks to the removable battery on the back of the device. Combined with an auto power save mode when the Tri-Fi isn’t connected, you can get hours of connection time before you need to plug it back in, even if you’ve forgotten to turn it off after use. This was terrific for long and busy travel days. In addition to providing 6 menus of information within the built-in screen (like data consumption, battery life, days left in your billing cycle, and active network status), the Tri-Fi can also offer up location-based navigation so you always know where you are. Right now you can purchase the 4G LTE Tri-Fi Hotspot for $99 on sprint.com or from Amazon Wireless for $0.01. Data plans range from $34.99 for a 3GB per month plan (which should be sufficient for most people) all the way up to $79.99 for a 12GB plan. Overall, this was an incredibly useful device to have handy, and despite not having a consistent 4G connection, the speed was strong enough to do what we needed. How could this device be blazing fast in Detroit? There is no Sprint 4G LTE service anywhere close to Detroit or SE Michigan?